The sun is coming up. The birds are chirping. The waves are crashing. It’s a beautiful morning in Waikiki. And the guests of the Polynesian Hostel are waking up to another fun-filled day of exploring the island, getting a tan, learning to surf, or hiking through jungles. Before heading out for the day though, we need to nourish our bodies with a good filling breakfast. Walk downstairs to our kitchen around 8:30 and you’ll find one of our staff members slaving away at the stove mixing the batter and flipping pancakes. That’s right, it’s our famous pancake breakfast everyone talks about in the reviews. Light, fluffy, warm pancakes straight from the frying pan to your plate. Top it off with some syrup, this is the perfect start to your day. Can’t just have one or two? No problem. Go back for more. Some guests can’t get enough, they go back for third and fourth helpings. And the best part, it’s free. 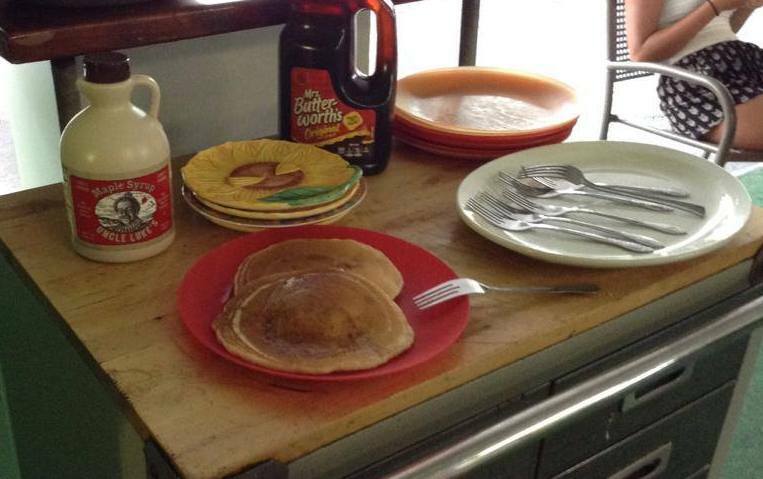 Polynesian Hostel has been providing its free pancake breakfast for about 3 or 4 years now. It’s in our kitchen every day from 8:30 am – 10:00 am. Our staff tends to cook extra cakes near the end to have them waiting for any late arrivals. But if you are late, act fast. Because once they’re gone, they’re gone. No more until the next day. Are you staying with us for an extended time? The same pancakes are served every day. So our long-term guests sometimes get tired of eating the same thing every morning. Is that you? Well, we don’t blame you. Mix it up a bit. The pancakes are there if you want. But if you don’t want, no problem. Head to the store and grab some milk and cereal and give yourself some variety. Or if you still want to take advantage of the free pancakes, why not try some different toppings. Some of our past guests have bought different jams, peanut butter, or Nutella to serve with the cakes. Or grab some fresh fruit from the local farmer’s market. Waikiki Beachside Kitchen – They’re on the same road as the hostel. Go right out of the gate and walk about a half block. This place opens at 8 am every day and you can get eggs, sausage, bacon, English muffins, and more. And most of their plates are only around $5.00. Bogarts – This little local cafe is a bit further away. It’s still walkable or you could take a short bus ride there. It’s on the way to Diamond Head. A favorite among locals, this place is known to have the best coffee on the island. They also have a full menu including omelets, bagels, waffles, breakfast burritos, and so much more. And all are reasonable prices. Go early to avoid the crowd. They open their doors at 6 am. Breakfast is the most important meal of the day. Having a good breakfast puts your mind, and your stomach, in the right place. Now we’re ready to tackle the day and have some fun. Aloha!